Usually chess journalists interview players, but it is also interesting to hear opinions about the chess world chess organisers, arbiters and sponsors. One needs to start somewhere and thus on the 26th of January I conducted interviews with two people, who work a lot to make the Corus Tournament in Wijk aan Zee a success. Our first interview with Anneke Eder, secretary of the Corus tournament. This interview was originally published in Chess Today. Anneke, could you please tell us how you got involved in chess? It started five years ago. 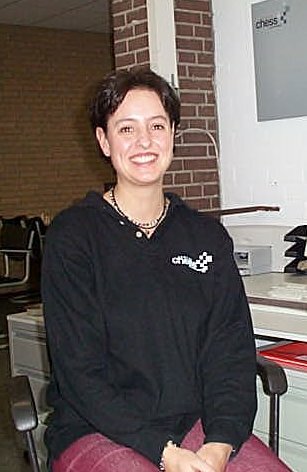 I worked for Corus (then Hoogovens) and they asked me to help with organisation of their tournament. I knew nothing about chess, but I said that I would like to try that work. And I liked it so much - this chess world! They are normal people, only maybe more lonely - you never see groups of people. You have seen many top Grandmasters. What is your impression of them? Is it easy to communicate with them? Sometimes it is very easy. But sometimes it is a little bit difficult and when they lose a game it can be very difficult! What about their sense of dress? Do you have anything to say about this? Players in the top section have a very good dress code - they always dress well. But players in the lower sections of the tournament can do better with their dress! :-) But things are improving, it was worse 2-3 years ago. Is the sponsor happy with the tournament? Does it get adequate return for its money? Yes, we are happy with the publicity. This year we had the tournaments a few times on Dutch TV, so the tournament gets a lot of attention. But in general chess is not very media-friendly. So, you do not regret that you took that job five years ago? Anneke, thank you very much for your time! 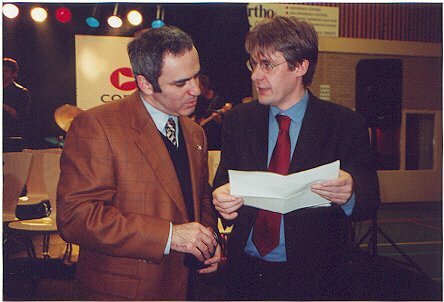 Our second interview is with Jeroen van den Berg (seen right with Kasparov) one of the main organisers of the event and its Tournament Director. Photo: Monica Cardinale This interview was originally published in Chess Today. Jeroen, what is your opinion about the current situation in the chess world, when we have different World Championships, different time controls and when so many changes are proposed by FIDE? From the point of view of the organiser, this is rather confusing. I already said in several newspapers that we have a tremendous field here this year - world's 1-9 players. And among them we have the former World Champion, the new World Champion and yet another World Champion. While I very proud of this field, I would rather prefer if we had only one World Champion. You probably know what I mean. This whole business of having two Championships is really damaging for the chess world. Now already for 7 or 8 years we have such a situation and the sooner it will be resolved, the better. As for new time controls and all changes from FIDE, on one hand I can understand why they want to speed up the game. It will be easier for organisers to manage tournaments. But as a chess player and fan I am afraid that these changes will hurt the game. You can reach higher level of play in a 8-hour game than in a 4-hour game. Also, for the Internet, which in my opinion is very good for chess, it does not matter how long the game lasts - people don't watch it all the time anyway. Maybe FIDE wants to make it more attractive for TV? My experience tells me that at least in Holland, country with good chess traditions and media attention, it will not make any difference. This year our tournament was on TV a few times, but it is always for a couple of minutes only. I think that it is much better to try to take advantage of the Internet, particularly if in a few years it will merge with TV somehow. What do you think of the attraction of chess to sponsors? Presumably it is not easy to find them sponsors for such a big event? It is unfair to compare chess with, say, golf or tennis, as chess tournaments are of interest only to those who can play themselves. But because the mind is involved, sponsors are interested. Are you happy with the way the tournament is going? Yes. Before the tournament I was afraid that there would be many draws as we have many players of similar strength, but my fears were unfounded. Everyone is trying -Kasparov, Kramnik, Morozevich and many others show fighting spirit. For example, look at the game Ivanchuk-Kramnik - an incredible fight! These interviews were originally published in Chess Today.